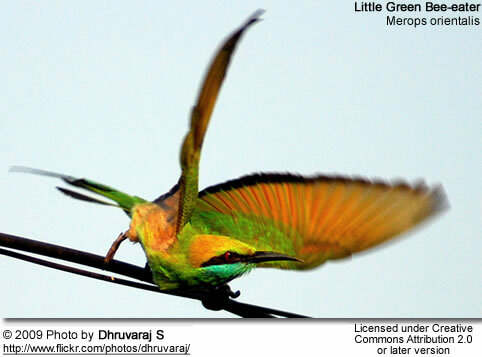 The Green Bee-eaters (Merops orientalis) are also commonly referred to as Little Green Beeaters which can lead to confusion with another member of the bee-eater family - the Little Bee-eater, Merops pusillus. It is resident in a belt across sub-Saharan Africa from Senegal and The Gambia to Ethiopia, the Nile valley, western Arabia and Asia through India to Vietnam. This is an abundant and fairly tame bird, familiar throughout its range. It is a bird which breeds in open country with bushes. In Africa and Arabia it is found in arid areas, but is more diverse in its habitats further east. This species often hunts from low perches, maybe only a metre or less high. It readily makes use of fence wires and electric wires. They are mostly see in the plains but can sometimes be found up to 5000 or 6000 feet in the Himalayas. They move seasonally but little is known. Migration is limited to seasonal movements depending on rainfall patterns. These birds roost communally, lined up on a tree branch. 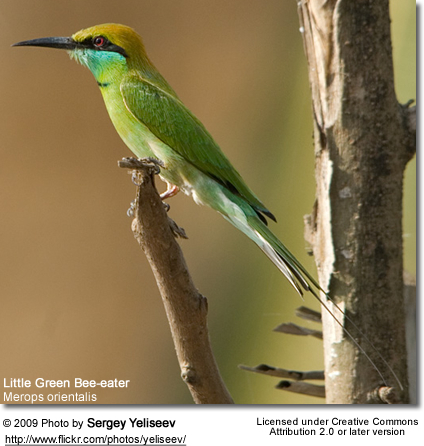 This species, like other bee-eaters, is a richly colored, slender bird. It always has green upper parts, but the head and underpart colors vary widely depending on the race. Thus, southeast Asian birds have rufous crown and face, and green underparts, whereas Arabian breeders have a green crown, blue face and bluish underparts. The wings are green and the beak is black. It reaches a length of 16-18 cm, including the two elongated central tail feathers. These elongated tail feathers are absent in juveniles. Sexes are alike. 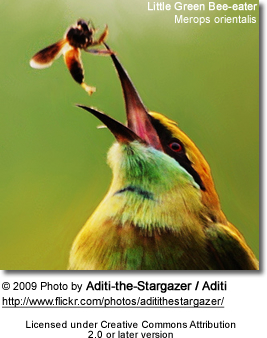 Special Skill: A study showed that Little Green Bee-eaters are capable of putting themselves in the place of other animals. They were able to predict whether a predator at a particular location would be capable of spotting their nest entrance and behaving appropriately. The ability to look from another's point of view was usually believed to be possessed only by the primates. The breeding season is from March to June. Unlike most bee-eaters, these are often solitary nesters, making a tunnel in sandy banks. They nest in hollows in vertical mud banks. The nest tunnel that they construct can run as much as 5 feet long and the 3-5 eggs are laid on the bare ground in the cavity at the end of the tunnel. The breeding pairs are often joined by helpers. 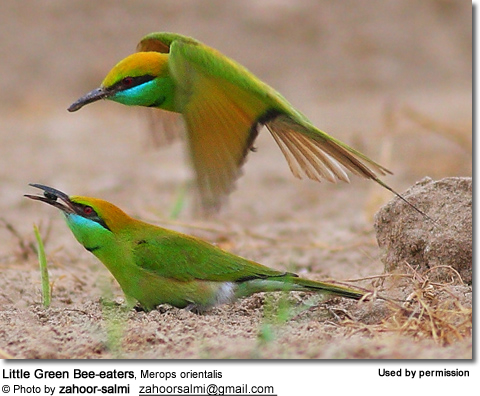 They sometimes form small colonies, or nest near other bee-eaters. They lay 4 to 8 spherical and glossy white eggs. Both the male and the female take care of the eggs. The call is a soft trill. Just as the name suggests, bee-eaters predominantly eat insects, especially bees, wasps and ants, which are caught in the air by sorties from an open perch. They can sometimes be nuisance to bee-keepers. This species often hunts from low perches, maybe only a metre or less high. They readily make use of fence wires and electric wires. 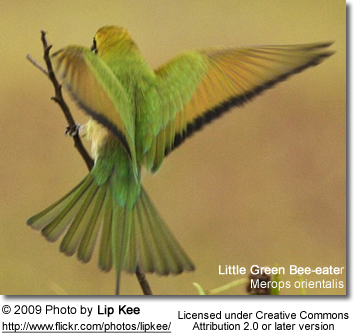 Before eating its meal, a bee-eater removes the sting by repeatedly hitting the insect on a hard surface.